The Muller's Wheel is a collaborative project combining the talents of pianist Tobin Mueller and saxophonist Woody Mankowski. These original tracks represent their personal journey through jazz influences -- from swing to bop to fusion to funk. The styles of Count Basie, Charlie Parker, Lester Young, Herbie Hancock, The Brecker Brothers, Weather Report and more influence this homage to the jazz greats. Even the blues are given Mueller/Mankowski's uniquely bop-funk treatment ("Struttin' Up Bourbon"). In all, the duo's originality permeate each track, each jazz sub-genre. This is joyous music. It reminds us of the happiness we relive when returning to our musical roots. Mueller/Mankowski remind us how the personalities of certain eras continue to assert their influence and power. Tasty electric guitar additions by Fran Dagostino, drumming by Dane Richeson and bass by Jeff Cox complete the album. Tobin's nephew Chris Mueller adds piano on "Cliff's Edge" and "River Runs Through Me" (songs from the Rain Bather project on which Tobin plays organ). "The Muller’s Wheel" title is based on the biological concept that mutation and DNA recombination creates cycles of growth and loss. It serves as a metaphor for the ebb and flow of the synthesis and creativity Mueller and Mankowski apply to their musical influences. The tracks are arranged in historical sequence, and the listener appreciates the cross-pollination between each of these genres. Listening from beginning to end creates a cyclical pilgrimage. It's rhythms and inventive flights of fancy invite the listener along for many return trips. For more jazz by Tobin Mueller, please see the album "Rain Bather" and Tobin's solo piano albums "13 Masks" and "Morning Whispers." For more B3 organ and progressive music by Tobin Mueller, please see "AUDIOCRACY: Revolution's Son." Tobin Mueller's solo album on which he also sings, "A Bit Of Light," is available as well. Tobin Mueller and Woody Mankowski’s 2011 release, "The Muller’s Wheel," was available only as a download, but it has now been beautifully remastered and released as a CD with much better sound quality and a clarity that really sparkles. Sounding much more like a live recording (without an audience), the interaction between the musicians is crisp and spontaneous. I thoroughly enjoyed the original version, but this new one is amazing! The content of the album is the same as the download version, but discerning ears need to have the CD to experience the music as intended! 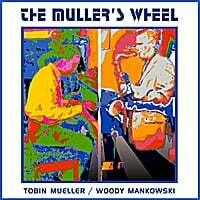 The Muller’s Wheel is a fascinating and exuberant piano/sax collaboration by Tobin Mueller and Woody Mankowski. Rather than presenting a compilation of previously-released material, they have created a brilliant retrospective of musical influences - jazz styles and artists that played a part in shaping their own artistry. Both artists are accomplished in many genres of music, so it is no surprise that their influences are also varied. Quoting Tobin Mueller, “This is a personal journey through jazz influences - from swing to bop to fusion to funk. For me, it begins with music my mother would’ve loved to dance to and heads toward music I like to dance to.” The original intent of the album was to create music based on works both recognizable and fun, but Mueller discovered that the force of personality cannot be contained. The collection includes three pieces from Mueller’s award-winning 2009 release, Rain Bather, as well as a vocal (by Mankowski) from Mueller’s 1996 musical, Creature. Mueller appears on piano, organ, and synths; Mankowski on saxes; Fran Dagostino on guitars; Arthur Kell on bass; and Dane Richeson on drums. “Seafood Gumbo” opens the set with an energetic yet playful swing style that lets you know right off that this album is gonna cook! “Oasis On the Rocks” picks up the tempo even more and lets all the artists shine. “Saddle Shoe Sally” is a very danceable sax showpiece with a sunny attitude. “Lost In the West Village” is a funky favorite and is very much a conversation between piano and sax. At almost nine minutes, all of the musicians have a chance to stretch out and explore the possibilities of the piece. Sometimes structured and sometimes experimental, it never loses momentum - great stuff! “Windowshade” was one of my favorites on Rain Bather and is here, too. “Fusion of Minds” is especially cool because it is performed with acoustic instruments rather than synths and electronic keyboards. Both Mueller and Mankowski take extended solos that showcase their individuality and then come back together as a seamless duo combining energies to make the music soar. Love it! “Distortion of Memory” slows it ‘way down to a sultry late-night slow dance or a film noir soundtrack. An effective contrast to the high energy pieces, it’s wonderful on its own. The blues-infused “Struttin’ Up Bourbon” features Mueller on organ and some great sax licks. “River Runs Through Me” is a slow, melodic beauty that demonstrates just how versatile these artists are. The vocal, “Shape of My Life,” goes in another direction altogether with a slow, soulful ballad. The closing bonus track brings the album full circle - a vocal of “Seafood Gumbo” by Angel Hope that’s bound to bring a smile. Tobin Mueller is always full of musical surprises, and The Muller’s Wheel is no exception. High energy and full of fun, it provides well over an hour of great jazz. I strongly recommend purchasing the full album to enjoy the retrospective aspect of the music. It is available for download from HYPERLINK "http://www.tobinmueller.com"www.tobinmueller.com, Amazon, CD Baby, and iTunes. Recommended!